I got my rug a week ago.it is very thick and plush.i love it.and its white. Celebrate the casual and carefree West Coast aesthetic with this cozy milky white shag rug from Safavieh's sensational California Shag Collection. Instantly brighten up any hardwood or tile floor to create a calming atmosphere that allows for a wide range of versatile styling options. It took me a long time to decide which white shag rug to buy, as between Safavieh and Nuloom there are about a million. What sold me on this one was the picture of a hand sinking down into the super plush fabric- and the fact that it had the highest pile out of all the white shags those two brands had to offer. I bought the runner for my gallery hallway in my bedroom, which at *** at the time was an absolute steal. I only wish I had a full room that would work with white shag! (My bedroom certainly would, but I had already gone with Nuloom's grey and aqua lace Adileh rug in 8x10 (which while sadly has not nearly as much aqua as the photos show, is still unbelievably gorgeous), which goes wonderfully with this runner. I was really nervous when I received the rug and took off one of the cardboard end-caps and got a glimpse of the edge of the rug- it looked like it had sparse, ultra spindly fibers sticking out in every direction, everything I had feared when ordering and dangerously close to how I had always pictured shag carpet until seeing it everywhere when rug shopping- a terribly sparse/matted 70s nightmare. The product photos had led me to believe that shag could be luxurious, even glamorous, and at that moment I thought they had LIED. As I pulled off more tape and pushed down more of the plastic, I became able to peel back a corner of the rolled rug- and to my astonishment revealed the most dense, plush, and yes, glamorous pile! I was so relieved, and so excited to get the rest of the packaging off and lay it out (which will take you a little while-they pack these things WELL). Once I had it all out, I could see that the slightly sparse edges were barely (if at all) noticeable, as they very quickly give way to this gorgeous dense pile that you can sink your hand (and feet!) into. There is this amazingly subtle slight sheen to the fiber that is in no way shiny or slippery (which is what deterred me from choosing the Safavieh Paris rug- that and the fact that it was more of a beige than a white or cream)- it's just this slight luster that makes the whole rug look luxe and rich and almost creamy, like much more expensive materials were used. This rug is seriously amazing, you guys. Unless you are trying to match this rug to a stark white (or stark white with say black or red), modern decor, I really can't see how you would be disappointed. My bedroom is white, aqua and silver, and this goes perfectly with it- though I have a sort of "beachy glam" thing going on, so all of my whites are of varying natural shades anyway. I have bought three Safavieh products for my new apartment, and I can tell you that each one of them just radiates quality and attention to detail. One of the items I bought was one of their handmade wool rugs, and I can tell you that this machine-made, non natural fiber, less expensive rug is given the same amount of care and commitment to quality as their more expensive lines. I'm so happy with this purchase. I have not cleaned the rug yet, so I can't attest to how easy it is to get dirt and debris out of the pile, but I imagine it will take more work than a low pile rug- but you kind of sign up for that when you go with shag. I will try to come back and update in a few months on durability, ability to stay white and ease of cleaning. The one thing I'm not 100% happy with is the length! It is only seven feet long, and I would have happily paid another *** to get it a foot longer. It's just a tad too short for the part of my hallway I'm using it in (I'm not using a rug in the first part of my hallway because I don't want the pile to interfere with the door to my room or the one to my walk in closet). Seriously, if you're on the fence about shag, get this rug. 3 stars. because its a 5 star product with a 1 star color accuracy. Let me explain it to you. So this was a great product per se, but I ordered white and the carpet is not white. I'm a man, so for me white is white. If I say I want white, give me white. The design in my room is black, red, and white. I put this carpet on my floor and it looked dirty. Not to say that it is dirty, but to make a point that it is NOT WHITE. The females in the house were talking about it being bone white or even ivory. I don't know what the hell those colors are but it is not white. Compared to the decor in my room, this was clearly not white. Other than that, its a great carpet. Feels great. I scoured websites and any store that sold large size rugs for 2 months. I was nervous to buy a rug online without feeling the actual texture or seeing the color ahead of time. 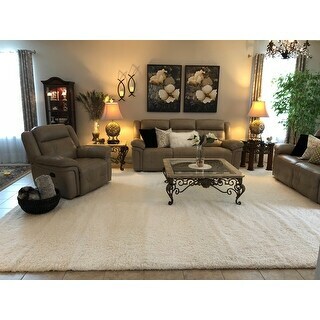 I called Overstock Customer Service before I purchased this 11 x 15 ft. White shag rug to see the return policy just in case it wasn't the right color once I got it in my living room. Due to volume of reviews on here debating the color, they assured me that I could return the rug if it wasn't what I wanted- and I would not have to pay the return shipping fee (which would be pricey since this rug weighed 85 lbs. at delivery!). I went ahead and purchased the rug- even though I was nervous! I am THRILLED with this product! After mulling over rugs for 2 months- this rug was softer, more plush, and strong quality compared to the custom order***rugs I looked at elsewhere. Buying a huge rug was a big purchase financially- but I can honestly say, this rug is awesome! In just 2 weeks I've already had many compliments on it. The color is really pretty white, as far as home decor "white" items go. The other colors in my living room range from Dove White on the baseboards, to ivory/off white on my throw pillows. This rug seamlessly blends in and looks white against my dark hardwood floors. For ****- I will never be able to find a rug this quality and size anywhere. Thanks Overstock, I'm a very happy customer! Very nice shag rug. It was more cream than true white but it looked great. These shag rugs are very versatile and I can definitely recommend. I was looking for a wool rug and came across this Milky White Shag. Instantly, I knew it was the “One.” I read at least 30 reviews before making my decision to order the 11x15. Based on the reviews and pictures posted, I was confident with my decision. Surprisingly, it arrived within 3 days! It was double wrapped and the rug arrived in excellent condition. My husband and I laid it in place with furniture anchoring on top. All I could say was, WOW!!! This rug is Gorgeous! It is plush, thick and soft. In my opinion the color is a fresh, clean creamy white. It’s absolutely Beautiful! My 15 month old baby grandson loves it. I have tile flooring and needed a soft surface for him to play on. Instantly, the family room was transformed into a warm, cozy, inviting and luxurious place to relax. This rug is well made and of good quality. The backing is tightly woven. I used an attachment without a brush head to gently vacuum it so as not to damage the fibers. There is no shedding. It fluffed up right away. It does have slight ripples where the fold lines were. It has relaxed very quickly and based on customer reviews, continues to smooth out. I love this rug!!! I’m so happy with it and how it looks. It was on sale which is always a plus. I plan on purchasing a padding for it and can only imagine how much softer it will feel. I received great Customer Service from Overstock when I called to place my order. This was my first purchase with Overstock and I couldn’t be happier with the professional and courteous service I received. Thank you for the invaluable reviews and thank you Overstock!!! This rug is so soft and plush. I put it over cold tile floor in my guest bedroom and I didn't use a rug pad and it still feels warm and cozy on your feet. The color is not white white but an off white which worked for me. The only problem is its hard to vacuum but that is expected with a shag rug. Highly recommend. Soft and plush, just what I wanted. A little shedding, but that's any shag rug. Exceeded my expectations based on price - love it! This is a really nice rug for the money. 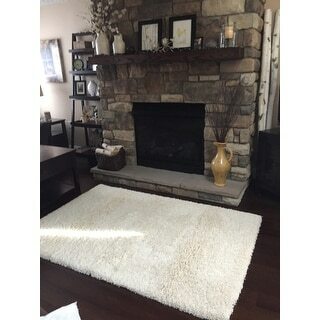 I was looking for a shag rug in white to change the style in my living room and after the positive reviews on here took a chance and purchased. Couldn't have been more pleased with the color and the quality. Is this white like chalk white..no. But I was looking for a light color rug and this is perfect. I would definitely buy this rug again in different colors for other rooms in the house that's how happy I am with it. 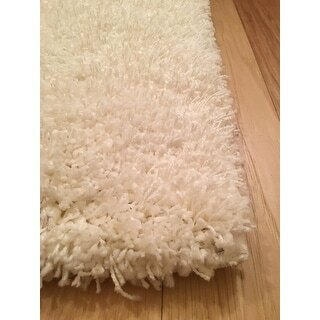 Do not order if you are looking for a WHITE rug...cream, sure - it's a great, soft rug. While a lot of the reviews are about the color of the rug being cream not white that is the least of the negatives that stand out to me about the rug. First of all its a high maintenance shag rug, and the weave is loose. If you shake it out and don't EVER walk on it, it looks great and will continue to look great with a periodic shaking out. But if you walk on the rug at all, the loose strands will get marled and kind of knotty.Besides that you cannot vacuumed it with a rotary brush vacuume and you have to hand pick any lint or specs of whatever falls into it because as I said, the weave is loose at the base of the weave. We live in a no shoes policy house and this rug was placed at the foot of my bed under a settee.It did not see much traffic and the first 3 months I really liked it. But it ended up looking terrible and full of stuff you can't vacuumed out of it. I don't have time to be constantly hand picking it clean and unless you plan on personally hand shampooing it and drying it outside in the sun, don't bother. Because for the price of having it professionally cleaned I can buy another rug. Actually for the price this is a throwaway rug when youre done with it. And I was glad to be done with it within 6 months. Nice thick rug for the price! 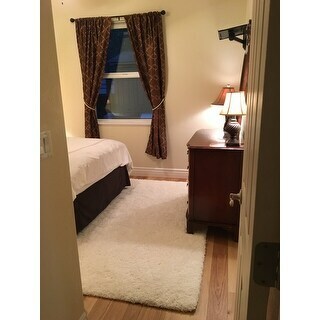 We ripped up old wall-to-wall carpeting in the downstairs of our home, installed hardwood flooring and purchased this rug for our guest bedroom. We wanted a warm and fluffy rug in one of the coldest rooms in our home. Not only does this rug make the room look bright and inviting, but it also has a nice thick pile. I was worried it would be thin, but the reviews were spot on. When we first unrolled it, it was a bit "lumpy" in some spots. However, it seems to be settling down the more we walk on it. I purchased it for in front of the fireplace and it is a definite asset to the family room. It is a very good rug for price, that said, the weave is not as close as I would have preferred if I would have been able to physical inspect it--none the less, for my purpose, it is more than adequate. The color is "white" but not a true white, if that makes sense. 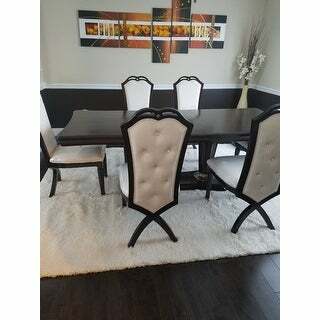 I have off white and ivory throughout this space and this rug fit well, if placed side by side it is whiter than my other accessories but I was looking for something slightly different--so it is perfect. The only negative I have is that like many items on Overstock, the photo does not accurately portray the item, in this case, the looser weave--but again, no one should inspect much more for the price. Overall this is an excellent purchase for the price, I would not recommend for high use areas. I was looking for a cream white color round shag rug to match our crown molding. I was not quite sure when looking at the web description, but one review helped. I BET it would be a cream white instead of true white and gave it a try. I WAS RIGHT! It is a very soft cream white. Perfect for us! It had all the folding tracks when arrived, but not a problem after using it for two weeks! Wish it could be denser, but still work well at current condition. Love Love Love!!! 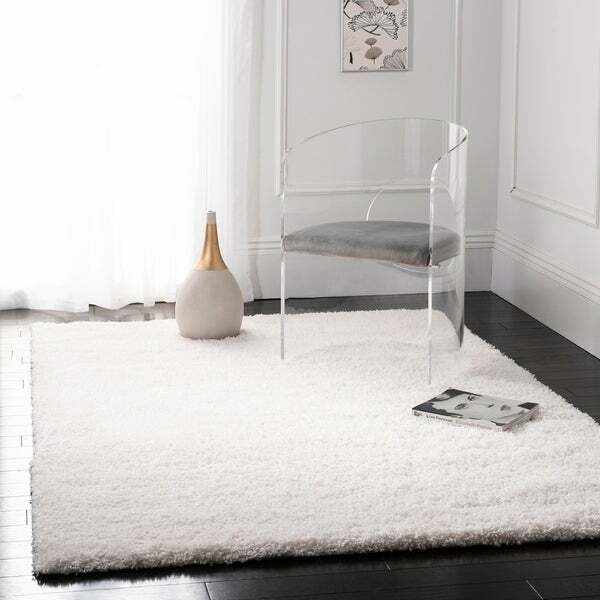 This shag WHITE area rug is perfect! This rug is so soft I can't stop walking on it!! I am so pleased. The color is not stark blinding white. It is a milky soft pretty white. It is not off-white. I chose this to put in my family room to give contrast to my dark hardwood floors. I love the softness and cozeness it gives to the room. It makes it a place you want to spend time in. I put the Mohawk premium on-slip felted dual surface rug pad under it. Beautiful rug, exactly as described. Hard to clean though, my vacuum won’t roll over and gets stuck on the ends of the shag. Will have to clean with a rented carpet cleaner. A magnet for hair. I love this rug. I love the color, the pile and the way it feels when I walk on it. No weird chemical smell that I can tell. I would definitely recommend it/buy it again. I love the color and feel - true white and make my room super cozy. Shipping was quick and easy! Very happy with this purchase. This rug is nice and plush, and the color is dead on to the pictures online. We have this in our living room, and get so many compliments on the style and softness. Recommended, especially at this great price. This is my third Safavieh rug and all have been excellent quality. This rug is a true white. I’m using it in a large powder room and it really brightens the room. I love it! I really liked how this rug looked, initially. It is a nice size, and really plush, and brightens up my living room nicely. The reason I am giving it only 3 stars is because it is really difficult to clean, and it has started to fray in some spots. Loved this rug so much that I bought a second one years after I bought the first when I needed another rug. Has held up very well for the price point. This rug has lasted over 5 years in my home and i still have it and it’s still as beautiful as ever. Everyone who sees it immediately ask where it’s from. "Hi there- Where can I find the acrylic chair on display as shown??" "Is this a true, pure white? Or does it lean more off-white?" This is intended to be a true white. Please note colors may vary due to dye lot variance in production. It’s very white. Worked perfectly for my daughters new apartment. She loves it! "What is the weight if the 8x10 rug?" The 8' x 10' size weighs approximately 65 lbs. "how thick is this rug exactly, I need to know if it will clear under my door"
I would guess at least an inch and a half at least. Our Roomba was unable to climb up to vacuum it, and our 2 Dyson's were extremely difficult to use on it as well. The rug is super thick but very cozy. "whats the weight in kg of the size 4'x 6'??" This rug is 100 lbs or approximately 45kg. "The listing is very confusing. Can you please confirm that the one that the one that is priced at thee hundred Eighty four is the second size listed. Nine feet six inches by thirteen feet"
"How is this to vacuum? Would my regular or handheld Dyson work on it?" We recommend vacuuming the back of the rug first to loosen the dirt and then gently vacuuming the pile. I use my handheld Dyson on it and it works great. Rug does not get much foot traffic, so for me it is easy to keep looking good. I have had this rug for about 9 months. We use a regular vacuum to clean it as ours is a large size.